Camping has long been a favorite pastime for many families. Since most of us lead pretty busy lives, it is nice to take a break sometimes. Camping is a wonderful way to unwind and surround yourself with the calming effect of nature. It takes us away from all the hustle and bustle and gives a chance to reconnect with our family. Of course, to make your camping trip a success, you first need to find a good tent. There are tons of tents out there but you want to choose from the best family tents. Most of the best family camping tents are 4 person and above. To help you with your search, we have put together some things you need to know about family camping tents as well the best family tents currently on the market. 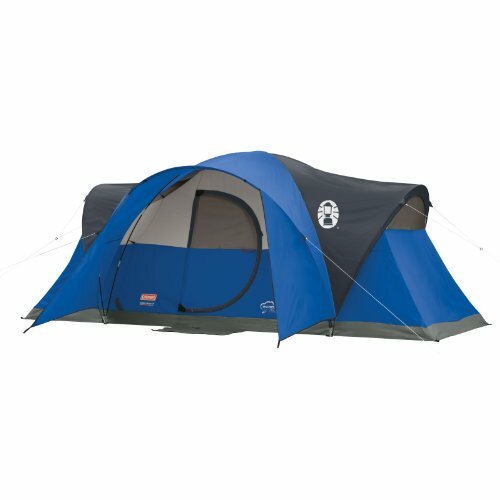 Featuring Coleman’s WeatherTec system, this tent will hold up in a thunderstorm while keeping you dry inside. 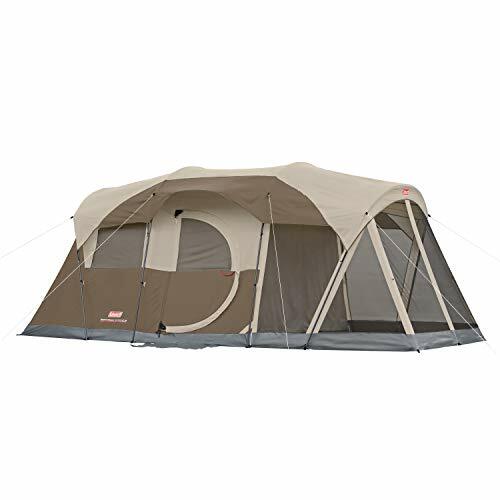 One of the best things about this tent is that is has 2 removable room dividers that you can use to divide the tent into 3 rooms. This allows for more privacy. This tent is great for big families. With 170 square feet of floor space, there will be plenty of room for everyone. With 2 large windows and a vented Cool-Air access port, you can enjoy a nice cross breeze inside the tent, keeping you cool and comfortable when it is hot outside. Even though this is a larger tent, the continuous pole sleeves, pin and ring design, and the InstaClip attachments make it easy to set up. This is the perfect choice for those who want to set up a tent without any hassle. The poles come pre-assembled and pre-attached to the tent so setup is a breeze. There is no separate rainfly for this tent because the tent fabric is thick and waterproofed. The floor is welded to ensure further weather protection. You are guaranteed to stay dry inside this tent when it rains. 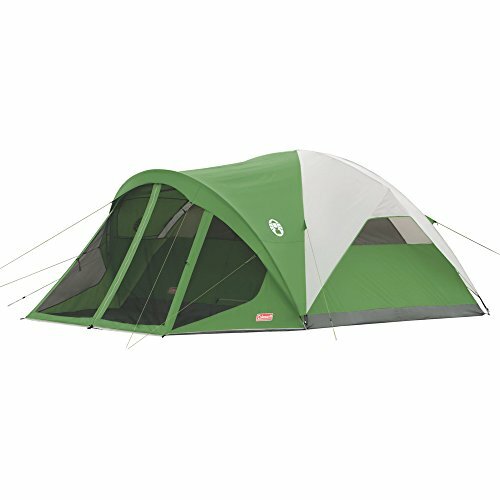 This tent has 7 windows, which provide excellent ventilation. It will never get stuffy inside. The 2 doors are a nice feature and convenient when sharing the tent. There is a room divider so that you can separate the tent into 2 rooms. Two queen-size air mattresses can easily fit inside. This 4 person tent is a great budget friendly option for small families. It can fit one queen size air mattress. With an InstaClip™ pole design and snag-free continuous pole sleeves, this tent is easy to set up. You can pitch this Sundome tent in just 15-minutes. Welded floors and inverted seams seal water out and keep you dry inside. The coated polyester fly forms an awning over the entrance, providing more protection from the rain and sun. 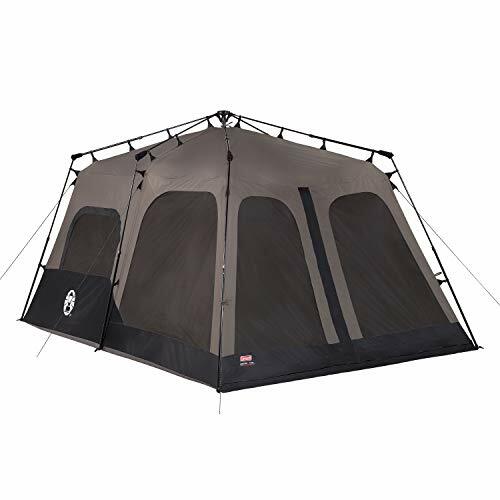 The shock-corded fiberglass frame ensures that the tent holds up in windy conditions. The ground vent and large windows allow for airflow. When you want to use electrical appliances inside the tent, there is an electrical access port for easy setup. One of the best features about this tent is the hinged door. It is held by Velcro so that you don’t have to use the zipper to close it every time you enter or exit the tent. It functions like a normal door. The cabin design allows for a spacious interior. This tent can be setup in just 15-minutes. 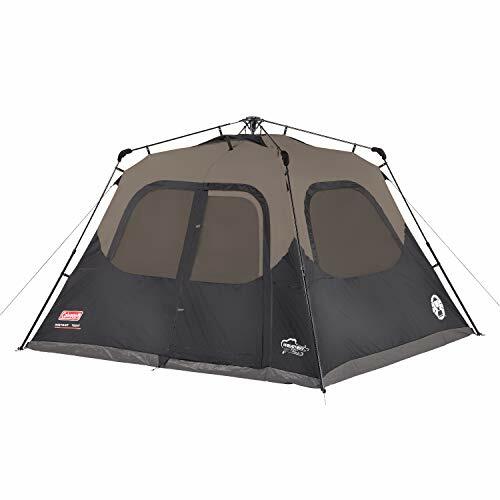 You are guaranteed to stay dry inside this weather-resistant tent and the windows are angled to further ensure water stays out when it rains. The rainfly forms an awning over the door which provides more protection from the rain and sun. The roof is mesh for great ventilation. You can enjoy gazing up at the stars when you leave off the rain fly. The fabric on this tent is twice the thickness of traditional tents. It is heavy-duty and the seams are taped so that the inside stays dry when it rains. This is why it does not need a separate rain fly. The floors are welded for further weather protection. This cabin style tent provides a lot of floor space and a lot of headroom. This makes the tent very comfortable. Two queen-size air mattresses can fit inside this tent. The poles are pre-assembled so that you can pitch this instant tent in just 1-minute. The guy lines make it sturdier in windy conditions and are also reflective so that they are visible at nighttime. The star of this tent is the screened in sunroom. It can be used as lounging area as well as a second room. It is a great area to eat your meals without bugs bothering you, and also makes a nice play area for the kids. The fully screened front porch makes for a nice bug-free lounging area. The 4 large windows provide excellent ventilation and also allow you to enjoy the scenic views of your camping location. 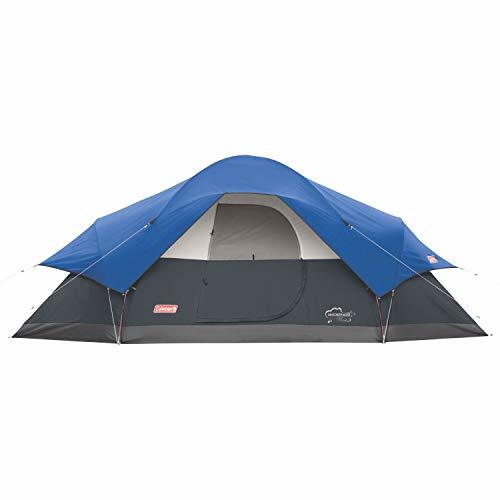 This tent has a spacious interior and can fit 2 queen-size air mattresses. 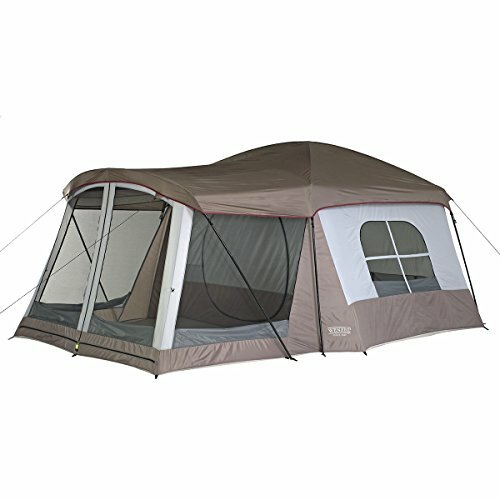 This 2 room tent has a floorless screened-in porch which provides ventilation and it makes a great hangout area. This tent is easy to set up and is designed to be weather-resistant, keeping you dry in the rain. When the rain fly is attached, air can still flow through the tent via the windows and roof vents. This tent has a Stow ‘n’ Go which makes it easy to store. The pin and ring system allow for a quick setup process. This 2 room dome tent is great for small families. For ventilation, it has 2 mesh doors, 3 mesh windows, and a mesh roof. There is a gear loft so that you can hang a light to illuminate the tent at nighttime. To get the most out of your family camping vacation, there are some important things you need to consider before buying a tent. This is of top priority when searching for a comfortable family camping tent. Pay attention to the amount of space a tent offers in proportion to how big your family is. Keep in mind that the recommended capacity listed for tents is the number of people it can hold without any extra space. For a family vacation, you want to make sure that there is enough room to comfortably fit your family. Also remember to get a tent big enough to fit your luggage in as well. This might not be an issue for some people, but if you are tall, you want to pay close attention to this feature. Having to crouch down when inside the tent is uncomfortable. You should be able to stand straight up at least in the middle of the tent. Cabin style tents provide the most headroom since they have vertical walls. The sloping sides of dome tents cut off some headroom. This is a key factor in choosing a good quality tent. A tent’s durability starts with the poles. Aluminum poles are the best since they are strong but light in weight. They don’t bend or break in windy conditions. Fiberglass poles are not as strong as aluminum poles but are a popular choice since they are inexpensive. The next thing to check out is the tent fabric. Nylon and polyester are the most popular choices for tent fabric. Nylon is durable and lightweight. Polyester has similar properties to nylon but is cheaper. Manufacturers apply a variety of different coatings to nylon and polyester tent fabrics to make them waterproof and more durable. Pay attention to the floor as well. A bathtub style floor is best since the seams are several inches off the ground, preventing water from leaking through the seams at ground level. In addition to a bathtub style floor, any good tent should also have taped seams, and a rainfly or durable tent fabric to prevent water from getting inside the tent. Since we can’t control the weather, make sure the tent will adequately protect you from the rain and wind. You will mainly see camping tents listed as either 3 season or 4 season. Think about what time of year you will be camping to choose the right season tent for your family. Three season tents are good to use in the spring, summer, and fall. They can withstand moderate weather conditions- moderate rain and wind. They are not suitable for winter use and cannot withstand harsh weather conditions. They protect you from rain while at the same time provide ventilation. Three season tents are the most popular kind of tent and are great for those looking to buy just one tent. Four season tents are primarily for those looking to camp in the winter. They are very durable and can withstand harsh weather conditions. They have heavy-duty tent fabrics that can hold up in heavy snow or rain. They will keep you warm in freezing temperatures. Since they are so heavy-duty, though, they don’t provide much ventilation. They should not be used in the summertime since the inside will get uncomfortably hot. You will find mainly 2 styles of family camping tents: dome and cabin. This is the classic tent shape and when you go to any camping site, you will likely see tons of dome tents. Dome tents have long been a popular choice for many buyers. The poles curve up and cross over each other at the top of the tent, creating a dome shape. This shape makes dome tents sturdy, and they can hold up even in windy conditions. Small dome tents are the sturdiest because as a dome gets bigger, it gets less sturdy. Dome tents are usually freestanding, making them easy to set up. They are also very easy to move once set up. This is an advantage when you need to move the tent quickly due to a change weather conditions. One of the things that make dome tents so popular is that they are usually less expensive than other tents. One drawback is that since they have sloping sides, they don’t provide as much headroom as other styles. Cabin style tents have been taking over the market. They feature vertical walls, resembling the shape of a cabin. They are a great choice for family camping trips since they offer more space than dome tents. Cabin tents are generally more comfortable due to their spacious interior. Cabin tents have higher ceilings than dome tents, and you can stand in them without hunching over. Cabin tents not only make more space for you but also for your gear. There will also be more room to set up your electrical appliances. More room for gear means fewer trips to your vehicle to retrieve items. Everything will conveniently fit in your tent. Some cabin tents have windows on all sides, allowing for excellent ventilation as well as panoramic views. If you have a large family, you may consider a cabin style tent to comfortably accommodate your family. Choosing a great tent is the beginning of a great family camping vacation. When you are on the market for a family camping tent, the many options may start to overwhelm you. But you can navigate the options easily when you know what you are looking for. Make sure it is big enough to accommodate your family, has sufficient height, and is durable enough to withstand wind and rain. Of course, keep the top 10 family camping tents in mind since these are the best picks according to user reviews. When you choose a good tent, it will be well worth the money. It will give you years of happy family camping vacations.